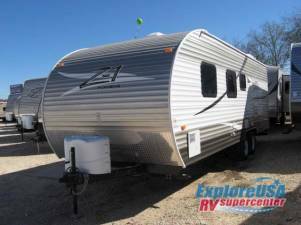 Z 1 Travel Trailer, Rear Lav., Med. Cab., Toilet, Tub, Pantry, Refrigerator, Range, Microwave, Dbl. Kitchen Sink, Sofa, Queen Bed, Dbl. Shirt Closet, Entry Cab., Booth Dinette, Overhead Cabinets Throughout, Ext. Kitchen w/Refrigerator & Much More.